Our loved ones should enjoy their later years, but sometimes it can be difficult for them to stay fully independent. Families who examine their loved one’s housing options often arrive at the decision to transition into an assisted living community. When a loved one has been anchored for decades in their own home, the transition should be approached with sincere sensitivity, supportive care, and loving kindness. Do unto others as you would have them do unto you is a wise principle to live by. And it works particularly well when helping an elderly family member transition to senior living. 1. Make an informed decision. Take time as a family to sit down with your loved one and look at options together. Evaluate the atmosphere, services, amenities, cost, and location of several facilities. Schedule a tour of your top choices. Meet the staff, residents, and families of residents while at the facilities you are considering. Trust your gut sense, and listen intently to your loved one’s desires—after all, you’re looking for their new home, not yours. Weigh your options and work together to reach a comfortable decision that you agree on together. Take your time. And when you’ve come to a final decision, rest in the knowledge that you are doing what your family and loved one has agreed is the best possible thing to do for their continued safety, well-being, and quality of life. 2. Take time to downsize. Although downsizing your parent is a lot of work, it’s important to do it right. Take time to go through their belongings together so you can reminisce and savor the memories of their past while preparing for their future. Set aside their favorite things to enjoy in their new residence. And help them identify where they would like the possessions they are not bringing with them to go. Assist your loved one in reassigning the things they can’t fit into their new residence to someone special they choose. 3. Personalize their new home. Hang your loved one’s favorite pictures in their new residence. Personalize the space with their treasured knickknacks, furniture items, and family photos. Do they have a favorite recliner? Place it appropriately in their new residence. Do they love to knit, read, or play cards? Create inviting locations within their new residence so they can enjoy their favorite leisure activities in a pleasant space. 4. Balance your availability with their opportunity to settle into their new residence. Take time to visit your loved one and keep in touch by phone between visits, but don’t smother them. They need time at their new home to initiate new friendships and create a new daily routine. Think of this transition as a launch into a new season for your loved one. Cheer them on while honoring their new lifestyle by giving them time to cultivate relationships on their own. 5. Touch base with the staff periodically during the transition. The staff observes and visits with your loved one daily, so feel free to talk with them about how the transition is going. Ask if they perceive your loved one is adjusting to their new home well, and inquire as to if there is anything you can do to help the transition. Think of yourself, the staff, and your loved one’s medical doctor as a team. Work together and communicate any concerns you may have. 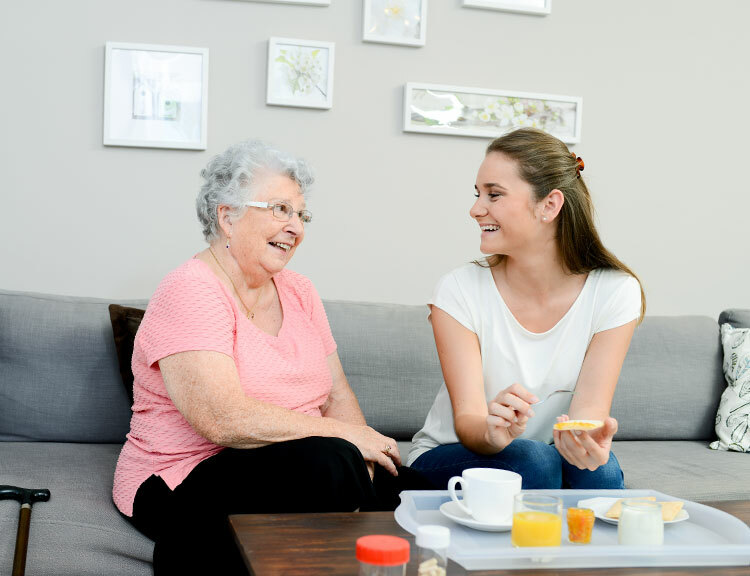 Each person on the team has responsibilities, and by working together, you can help each other facilitate the best possible living environment for your loved one. 6. Ask for help if you or your loved one needs it. Everyone experiences some type of challenge during transitions. Healthy people seek help when problems arise. If you need physical help when moving, call on friends and neighbors to pitch in for a few hours. If you need support after the move, consider reaching out to a friend or counselor. If your loved one needs encouragement or help emotionally with the transition, listen with a compassionate ear. Perhaps offer to take them to see a counselor. And help them develop friendships with other residents if they need a little nudge to do so. Once your loved one has moved into an assisted living community, enjoy life together every chance you get. Perhaps schedule a weekly visit and bring something fun to do together each time you connect (ideas include a puzzle, Jenga, Catchphrase, or simply look at old photos together). Nothing is more valuable than the memories you share with your family, so intentionally make them—and do it regularly. Make arrangements to pick them up for special occasions, holidays, or even a symphony from time to time. And find an activity within the facility your loved one plans to attend, and ask if you can tag along and participate in the activity together. We understand how overwhelming it can be to maintain total independence in later years. That’s why since 2000, The Parke has helped seniors enjoy their independence in a caring community environment. The Parke balances care, community, and independence so your loved one can enjoy the quality of life they desire. Your loved one’s new residence will give them the freedom to enjoy life while surrounding themselves with people who care and provide the assistance they need. Contact us today to schedule a tour of our beautiful facility, meet some residents, and enjoy a complimentary meal.